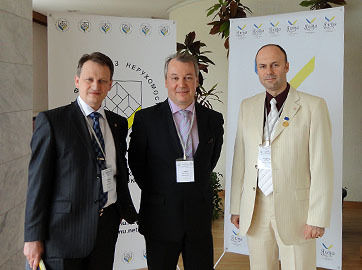 Timo Multanen, President of CEPI, participated in the Congress of the Ukranian Realtors Association URA) in Yalta. This represented an excellent opportunity to tighten links with professionals in Central Europe, better understand the market developments in the country and explore avenues for collaboration and future membership of URA to CEPI. “I greatly appreciated the warm welcome of the Ukranian colleagues, and my very special thanks go the Victoria Nikolenko and Sergei Zliden, the newly elected President”, says Timo Multanen. “The Ukranian economy and real estate market in particular face important difficulties and challenges. It is CEPI’s responsibility to listen to the voices of real estate in this country and to better understand the specific challenges and demands of the professionals. I am happy that CEPI and URA strengthen collaboration and explore how to jointly service the professionals”. URA (Ukrainian Realtors Association) is a Ukrainian organization founded in 1995 for representation and protection of social, economic, artists and other interests of its members and to support the development of the realtor activities in Ukraine, country with 45 million inhabitants. URA represents professional operators of real estate and labor collectives dealing with real estate activities and has 27 regional (provincial) offices and local branches throughout the country. Currently URA has 890 individual members and 28 corporate members. URA performs active and constructive social activities that aim to satisfy and protect the legitimate social, economic and other interests of its members and the development of the real estate market in general. It has extensive experience of cooperation with the subjects of legislative and executive authorities of Ukraine and links up to many organizations, institutions and enterprises. URA is a member of the Council of Entrepreneurs and has a cooperation agreement with the State Property Fund. URA is also one of founders of CEREAN and ICREA. The congress took place in Yalta. Yalta is a city in Crimea, southern Ukraine, on the north coast of the Black Sea. The city is located on the site on an ancient Greek colony, said to have been founded by Greek sailors who were looking for a safe shore ("yalos" in Greek) on which to land. It is situated on a deep bay facing south towards the Black Sea, surrounded by wooded mountains. It enjoys a warm Mediterranean climate with many wineyards and orchards in the vicinity. The term "The Greater Yalta" is used to designate a part of the Crimean southern coast spanning from Foros in the west to Gurzuf in the east and including the city of Yalta and multiple adjacent urban settlements. The existence of Yalta was first recorded in the 12th century by an Arab geographer, who described it as a Byzantine port and fishing settlement. It became part of a network of Genoese trading colonies on the Crimean coast in the 14th century, when it was known as Etalita or Galita. Crimea was captured by the Ottoman Empire 1475, which made it a semi-independent subject territory under the rule of the Crimean Khanate. Yalta was annexed by the Russian Empire in 1783, along with the rest of Crimea, sparking the Russo-Turkish War, 1787-1792. In the 19th century, the town became a fashionable resort for the Russian aristocracy and gentry. Leo Tolstoy spent summers there and Anton Chekhov in 1898 bought a house (the White Dacha) here, where he lived till 1902; Yalta is the setting for Chekhov´s short story, "The Lady with the Dog", and such prominent plays as "The Three Sisters" were written in Yalta. The town was also closely associated with royalty. In 1889 Tsar Alexander III finished construction of Massandra Palace a short distance to the north of Yalta and Nicholas II built the Livadia Palace south-west of the town in 1911.